Okay, this is one of those days that nearly paralyzes one with the sheer possibilities. It's Halloween here in the USA, and it's also Samhain, the anniversary of the assassination of Ghandi, the eve of Dia de los Muertos / All Saints Day, and the birthday of Vanilla Ice. Okay, we're not going to spend any time celebrating that last one. But the others are all viable, leading me to near choice-freeze when thinking about writing today. What's keeping me from locking up completely was the great listener response to last Friday's episode of Spin The Globe, featuring music for Halloween and Day of the Dead. You know, musics dark and spooky, songs about ancestors and ghosts and demons. That kind of thing. The show elicited lots of listener calls, particularly for the electro-tango of Tango Saloon and the non-Halloweeny sounds of DeLeon. 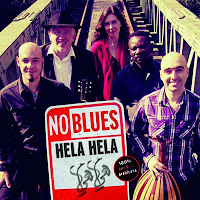 Also on that playlist was to cover of "Spooky" by ethno-blues outfit Slide To Freedom (reviewed here a couple weeks ago), which got me thinking about the ethno-jazz troupe No Blues. Hela Hela is more than just a new album. On this record, Ad van Meurs, Haytham Safia and Anne-Maarten van Heuvelen Show That They Are true masters of this new genre They created an ad and They play fully African flavor to the blend. The band takes the listener on a musical journey across continents Several. On Hela Hela you find Palestinian Morad Khoury guest musicians on violin, and as guest vocalist Shereene Danial All which ad strength and depth to the combination of American and Arabic musical tradition. This comes together perfectly in the title track Hela Hela work based on a traditional Arabic song and an American counterpart. This is the ultimate appeal to the world for working together. For today, I want to post the most arguably Halloween-ish track on the album, the song of love-turned-to-murder "Digging a Grave." Yes, it's a stretch, since nobody later rises from the grave as a zombie/mummy/vampire, but I'm sticking by my choice. And I urge you to check out their other songs, most of which feature more apparent Arabic influences. Try "Farah" and "Le" and "Hela Hela" (available as a free download) for example. Free listening at the band's Bandcamp page. As far as I can tell, this 2010 album hasn't been released in the USA, and is not readily available from US retailers. You can, however, find it at Amazon UK. Nice song, and the lyrics are funny. 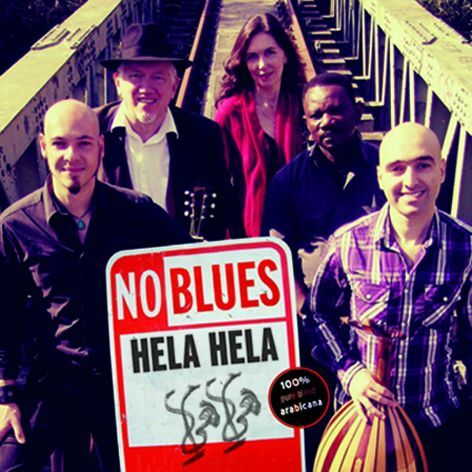 Although I feel that the Arab-Americana combination comes through better in the Hela Hela song I downloaded from their Bandcamp page. More Arab Fusion from Amsterdam: I really like the album Sharqi Blues by guitarist Jan Wouter Oostenrijk. He mixes raï with some heavy guitar-jazz, and the result is splendid! And guest-star Karim Ziad on drums makes for a groovy rhythm. I can definitely recommend this one. I've run across Sharqi Blues before, or at least it rings a bell. I'll be sure to track that down -- thanks for the recommendation!